We are pleased to offer a selection of TYPE OF PRODUCTS... But, first! Weighing a mere 105 lbs., the Vantage Graveliner can be interred and repositioned without heavy equipment, reducing labor costs, workers' compensation claims, and damage to cemetery grounds. An entry level sealing unit that is thoughtfully designed to satisfy traditional cultural requirements at graveside that meets or exceeds cemetery regulations. Our line of Air Seal vaults takes advantage of the natural principal of captured air to keep water from rising into the vault. 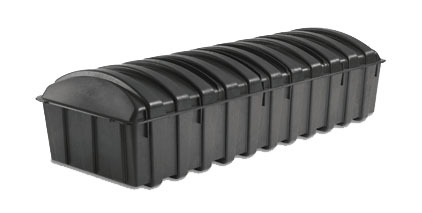 Seamless construction of non-porous polypropylene, plus a polymeric gasket and interlocking components assure a tight seal. The Paramount Vaults are designed with distinctive elegance. Their Granite appearance finished in Dove Gray, Rosewood, Lapis Blue, Cherrystone or Remembrance White offer a choice of styles for your loved one. Paramount Vaults feature the exclusive Vantage Duoseal double sealing system, stainless steel latches and are backed by a 100 year warranty. 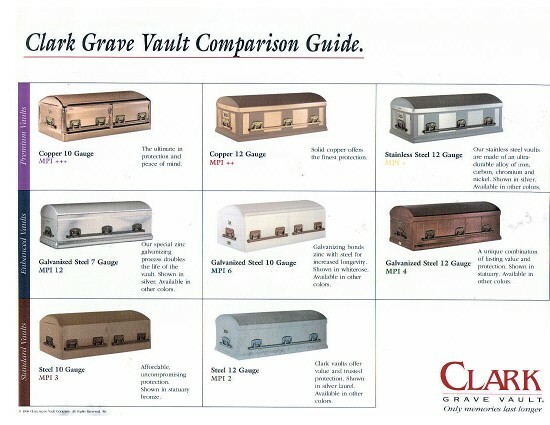 v Sealed in the grave like a traditional vault, Ultima allows graveside services to proceed without interruption. This makes the Ultima extremely attractive to families and mourners, as well as the deathcare providers who serve them. 14 Gauge Steel Grave Liner by Wise East Tx. 12 Gauge Clark Copper Price: $16,999.00 - the best metal unit available!